Many homeowners get confused about how much they should water their plants, trees, shrubs and lawn. Watering your landscape and garden properly is vital to keeping your plants healthy and your yard beautiful. In some ways, it is THE most important ongoing task you will have. As a general rule of thumb, we recommend checking your plants once a week from early March through late November. But during the long, hot summer months, your gardens may need a bit more water at more frequent intervals. If we are suddenly dumped with four or five inches of rain in a week’s time, however, your plants will need extra time to dry out. So, bottom line? Get to know that garden soil up close and personal by checking it a few inches below the surface during your weekly rounds. Your hand will tell you if your plants are really thirsty or if they are ok for the moment. Sprinkler systems can be a helpful tool to keep your landscape and lawn lush and green. However, it is easy to kill your plants with watering kindness. Underwatering is easy to do in the first couple of weeks. Overwatering is probably the number one issue with plants after the first two weeks. It is important to keep a watchful eye for the first few weeks after planting and adjust your timer to make sure your new plants get the right water. Weather and temperatures swings happen in St. Louis. It will be crucial to check your soil often over the first several weeks and when the season changes. Adjust your timer to keep your plants moist but not saturated. Adjustments to run times during the first year will be needed to keep your plants healthy. If you have new trees and shrubs in your yard or if it’s been unseasonably dry, you’ll need to offer your larger plants a bit of extra care. Place your garden hose at the base or trunk of the plant, allowing the water to run at a slow trickle long enough to saturate the entire root zone. If the water tends to run off, it may help to go to another plant and then come back in a few minutes to complete the watering. After the first year, you can relax a bit and reduce watering established trees and shrubs to every three to four weeks – June through September. Maintaining a 3” layer of organic mulch greatly reduces water loss to evaporation. A handy tool for testing moisture in the soil is a garden probe, which can be a fancy gadget or a simple resin stick, and you use it in the same way bakers use a toothpick. Stick the probe in the garden soil next to plants or in your patio pots; then, pull it out and note if there is soil clinging to the probe. If so, your plants are probably ok on water. If the probe comes out dry, you need to water. For best results check 8″ to 12″ deep with your hand or the probe, underneath the mulch line to the ball of the tree. Groundcovers such as English Ivy, Vinca (Myrtle), and Pachysandra help keep the soil cooler thereby reducing moisture loss and provide beautiful borders and color interest. But in order for these tender plants to spread and become established, they must be watered every other day for the first month, and then once every week thereafter for the next two months. If planted in late spring (after May 15th) or in the summer, watering may be necessary on a daily basis. A rotary sprinkler works best for large ground cover beds. Care must be taken when watering annual flowers, perennials and ground covers that are next to landscape shrubs. After the first year your ground cover should be watered every two weeks from June through September. Mulch is also highly recommended. Seeded lawns should be kept moist until a uniform stand of grass is established. Apply enough water to keep the soil moist, but not so much to cause run off. Sod should be soaked daily the first week after installation. After the first week, sod should be watered every two to three days. If the sod shows signs of drying or turning brown, it should be soaked immediately. Does it sound like watering will be soaking up too much time? Going out each week and probing around in the garden soil or moving the hose from spot to spot may work in your schedule just fine, but if it doesn’t you have other options to keep things “just right” for your plants. Soaker hoses are heavy duty garden hoses with small holes at regular intervals that deliver water directly to the root zone of a plant, allowing the water to seep slowly into the soil drip by drip. 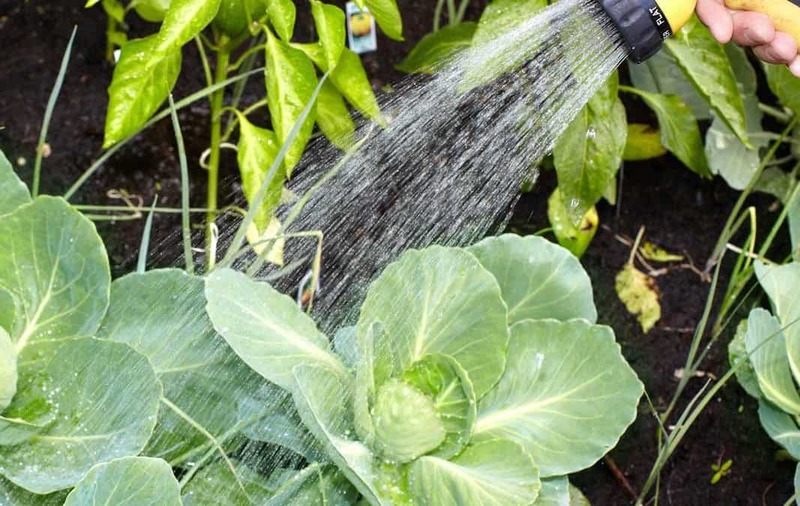 Utilizing this method of watering means the water gets delivered at an ideal rate for the soil to absorb it and hold onto it. And here’s the best part, once a week you’ll go outside, turn on the garden hose that is connected to your soaker hoses and just walk away. Walk the dog, start dinner, answer your email and then come back and turn off the hose. Done! Adding simple timers to the faucet can help eliminate the times you forget to turn off the water. Check out our Garden Center for soaker hoses. We’ll be glad to help you select and place them for optimal efficiency. You might be thinking “Can you just do this for me?” Well, not exactly. Once we have installed your plants, watering does become your job. While we design our landscapes to make the best use of water, watering must happen on a fairly regular basis. That said, when we create a landscape design, many clients have us include an irrigation system that will, essentially, “do the watering for them”, at least through the spring, summer and fall. If this is something you’d like, the option is yours. If the winter months turn out to be dry, with little or no measureable rain, instead of wet, your evergreens and newer plants will need some supplemental water. Even if you have invested in an irrigation system, it won’t be operational during the winter months. Your yews and boxwoods are looking to you for help. A few buckets of water (5 to 10 gallons) poured slowly around the base of your evergreen plants even if the ground is frozen will do the trick. Watering is a simple idea, but as you can tell it can get complicated. And, many factors we haven’t mentioned affect your watering schedule: the type of soil you have, the plants within your landscape and your ability (and desire) to spend time in your yard. We suggest you take time to plot out your watering schedule, based on your unique situation. Take a look at your average week and think about how much time you can (and want to) set aside for gardening. Think about areas of your property that are going to need extra attention, plants that might require extra water. Be sure to give us a call. We’d be glad to go over your plan, make some suggestions and help you get started. We want to help you find enough time to not only water adequately but also enjoy the wonderful outdoor refuge you are creating.